We've entered the orthodontia years. Nathan is currently moaning himself to sleep over the pain he's feeling in his mouth, and I'm feeling like a super lousy parent for signing him up for a couple of years of braces. 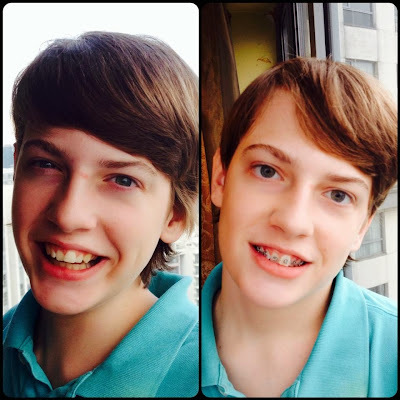 Thankfully, the actual braces are a whole lot smaller than the ones his Dad and I had to wear at his age, and thanks to advances in technology, the estimated time he'll need treatment is also smaller than the four years I wore them and the five years Michael wore his. If it was only a matter of some crooked teeth, I'd be tempted to be very un-American and let them be. However, he's got some actual issues with the way his jaw is formed, and the longer we wait the harder it will be to fix. We've already waited longer than is ideal, but this nomadic life isn't conducive to ongoing treatment. Thankfully, a long search here in Shanghai netted a great dental group with a gentle specialist Nathan can tolerate (it's been a long road with this kid for anything related to the medical or dental profession), so there's no time like the present. Nathan has been dreading this day, and nearly sang with joy a month ago when we had to postpone his brace-applying appointment a bit to give us time to get the funds together (you have to pay 100% of the cost up front here). I gave him a long pep-talk before Michael took him to his appointment, about how everyone in the whole world goes through an awkward stage right around this time in their lives. No one gets out of it, not even presidents, kings, or supermodels. So really, the best thing to do is to go ahead and embrace the awkwardness proudly by smiling despite the braces, because awkward is awkward and there's not really much you can do to increase or reduce it while you're in the middle of it. When I realized maybe I was sounding like I was bidding him farewell at the side of the road next to the entrance of Awkwardland, I just gave him a big hug, told him I was incredibly proud and that I loved him more than I could ever have enough time to express it in words. I hope he can eventually fall asleep tonight. I hope the Advil will kick in enough to take the edge off. And that some day he'll make a less awkward speech to encourage his own child when their turn comes to have the lovely combined Rose/Chase dental anomalies realigned into something more pleasing. Maybe the mother of his children will have naturally perfect teeth and pass it along to their children. Sigh. Parenting is not easy. I have a feeling that my kids will need to pay for their own braces! I just posted about Emily getting braces. She couldn't eat solid food for a whole week. Just jook (rice porridge for every meal) I feel that it's a child's right of passage to get braces. Seems like all kids are getting them.. many earlier then later. Yes Parenting is not easy.. and not cheap!Hang in there Nathan.. Emily's gotten used to them and the different colored bands they get help change it up a little..or maybe it's a girl thing. Just look forward to that 'more' beautiful smile..
Cez, I saw your post! Our babies are growing up together, apart! Nathan's braces are kind of spring-loaded with a very petite profile, so no need for the rubber bands. He is sooooo grateful about that, as anything that attracts attention to his mouth is a bad thing in his eyes! MsCaroline, so very, very true. I had to lock myself in the bedroom so he didn't see my tears to match his. Gotta be strong and all that... His teeth are not level, the flat surfaces all lean in to the center of his mouth, so the braces to straighten the top teeth are the first step, and then there will be a crazy apparatus which will widen his jaw and set the teeth upright. I was missing four permanent teeth and had giant gaps that had to be closed up and my own lower set of teeth had to be brought forward (vs. the top being brought back). I was the happiest girl alive when they came off! And I know Nat will be thrilled a few years down the line... Good news is he's already doing much better and not even noticing unless I ask. Until they are tightened at his next appointment anyway!